Afternoon Loverlies! I finally have received this book I have waiting on called Finding Spiritual Whitespace written by Bonnie Gray. First off the cover on this book is gawgeous!! It is so simple and just brilliant! This book was very interesting to read, I read it in about a day. But I know I am going to have to go back and reread and rethink the questions that are at the end of every chapter. This author writes about her rough childhood and how it brought about PTSD. She also explains how she has been getting through this with God's help, and the actions she and her therapist have decided she should do. I felt I could easily relate with her about her anxiety attacks and about lack of friends when you are dealing with mental health issues. Sadly, you do find out easily who the true friends are in these situations. Gray also speaks about how everyone needs to find their spiritual whitespace. Take time for themselves to rest, relax, and just be with God. You can find whitespace in everything, be it crafting, drawing, drinking tea, or even staring at God's beauty. There are plenty more activities or non activities you can do to find your whitespace. She states, "whitespace signifies space for a story." I think this book will be easy to read daily, just like a devotional book. I really enjoyed reading this book and will enjoy reading it again and again. Also go over and check out Bonnie Gray's blog HERE. She has been posting a 21 days of rest challenge for anyone to do, which looks interesting. Her link is also where you can purchase the book for yourself. :) Have A Blessed Day! "Our souls are canvases too, longing for quiet and beauty. Just as beautiful art needs whitespace, we need whitespace: spiritual whitespace. Our soul needs rest. To find balance and beauty." Move beyond Coping and Surviving to a Rejuvenating Place of Soul Rest How many of us find ourselves exhausted, running on empty with no time for rest, no time for ourselves, no time for God? Bonnie Gray knows exactly what that's like. On the brink of fulfilling a lifelong dream, Bonnie's plans suddenly went off script. Her life shattered into a debilitating journey through anxiety, panic attacks, and insomnia. 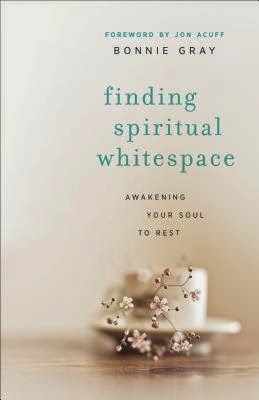 But as she struggled to make sense of it all, she made an important discovery: we all need "spiritual whitespace." 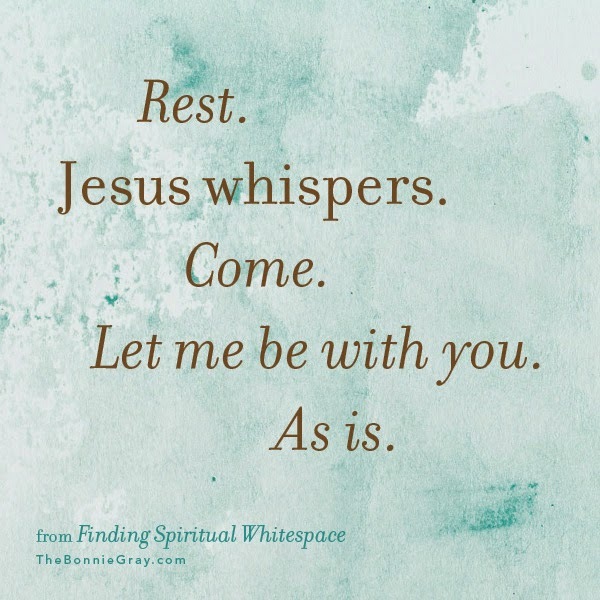 Spiritual whitespace makes room--room in one's heart for a deep relationship with God, room in one's life for rest, room in one's soul for rejuvenation. With soul-stirring vulnerability and heartbreaking honesty, Bonnie takes readers on a personal journey to feed their souls and uncover the deeper story of rest. Lyrical writing draws readers into Gray's intimate journey through overwhelming stress to find God in a broken story and celebrate the beauty of faith. Guided by biblical encouragement and thought-provoking prompts, Gray shows readers how to create space in the everyday for God, refreshment, and faith. She also offers practical steps and insights for making spiritual whitespace a reality, right in the midst of the stress-frayed stories in every season of life.